I just received this achieve today on Oct 22, 2014 while checking mail on my alts. Believe its yet another one of Blizzards bugs the comments say that you have to reach level 100 first. Also says its account wide achieve but I only have it on my 1 horde toon with the least amount of rep. I can't tell which reputations this actually includes. Looking at the status on the achievement, I have 2/3. However none of my "Warlords of Draenor" factions are Exalted yet. For some reason I had 2/3 as well, I had just hit exalted with Steamwheedle Preservation Society and it got me the achievement, anyone else encounter this? The achievement Savage Friends is granted when you reach exalted status with 3 Draenor reputations. This will allow you to purchase the plans to the level 3 trading post which are bought from Rezlak, the blueprints vendor inside your garrison. Note: this does not give you a 20% reputation boost on all characters on your account, it simply allows you to buy the blueprints on EVERY character on your account. That means you will still have to build a trading post and get the resources AND gold to upgrade it to level 2 and finally to level 3, unlocking your 20% reputation boost on that character. Once earned, it unlocks the blueprints for all of your characters (although you will still need to purchase the blueprints on each individual character you want to build the level 3 Trading Post for). Barracks Bodyguards do not count toward this achievement. 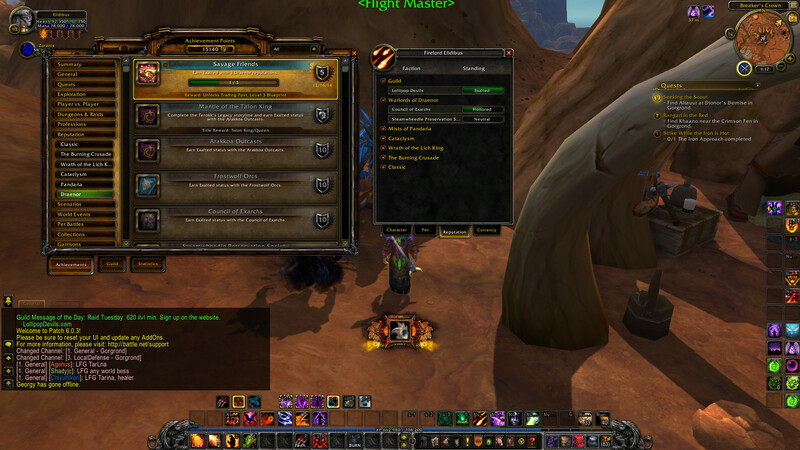 Although Nat Pagle reputation can be gained in Draenor, that reputation does not count toward this achievement. I got this today without having any Draenor faction at exalted, the counter says 2/3. This after the hotfix reducing the number of factions require at exalted from 3 to 1. I received this achievement today 12/10/14, The counter says 1/3, and I have the achievement completed, yet I don't even have a draenor faction at exalted. Trading Post: The Savage Friends achievement now only requires the character to become Exalted with 1 Draenor reputation (down from 3). I made a new Human, a hunter (Im trial btw, so i can't even go to Draenor) and i saw this Achievement pop up, and go away again. Its not standing in my achievements, but i did see it. December 16th, I received this achievement with zero Draenor factions at Exalted. However, I became exalted with my GUILD while in Draenor 3 times. It appears that this counts, for now. No doubt this will be patched in the near future. I got this on 12/15/14 on my priest, he is level 90 and I don't have WoD. I just created a level 1 Dreanei Priest on a trial account and when logging in for the first time received this achievement. Just got this last night after a Highmaul raid. I zoned into my Garrison and it popped up. I do not have any reputations at exalted yet. Regardless I still purchased the level three blueprint. Interestingly enough, I had made a new alt before the raid, a Human hunter. When I logged into her, the achieve popped there as well. I didn't know about the hotfix (that now is only 1 rep required) but the fastest reputation I got into exalted was the Ashran faction rep. The 20% extra rep from the tier 3 building comes handy to get the Frostwolf rep higher for alts when doing quests, you can save a lot of grinding. I made an orc shaman and got the achievement even though I have no exalted reputations. But, I'll take it. Didn't know about this bug but came to Wowhead to see if others were getting this achv. Made an orc warrior and same achv popped up. Im only about halfway exalted with two factions. Cool bug. Went ahead and bought my much needed upgrade to level 3 storehouse. Lies! No bug in the achievement for me, which alliance faction is the easiest/fastest to get to exalted? Just tested this and as of writing this comment tanaan jungle Rep's don't count for this achievement. I kind of hope they change that in the future because it is a Draenor Rep.
Edit: talked to a GM about it and they said that currently it is bugged and cyberstalker should count for it and that it will count once they fix it. As of Patch 6.2, Hitting exalted with the Tanaan Jungle Factions does grant this.Put in a GM Ticket, They will grant it to you. Though you see him in your Horde garrison from time to time, Vol'jin's Headhunters is also not a faction that will earn you this achievement. As of today (Patch 6.2.2) Tanaan factions count for this achievement. I was awarded this achievement as soon as I logged in (without GM intervention). At the time I had only the 3 Tanaan factions at exalted but no other Draenor factions.